In San Antonio, more than 1,700 pounds of nonperishable items were collected during the two-week drive, which ran from November 1 to 15. Locally, the Giving Thanks, Giving Back Thanksgiving Drive benefited Christian Assistance Ministry (CAM), an organization that provides a variety of social services, including groceries, clothing, sack lunches, school supplies, financial assistance for prescription medications, transportation or utilities and spiritual support to those in need. David Weekley team members provided the collected items to CAM to distribute to families in time for the holiday. The mission of Christian Assistance Ministry is to provide encouragement and help to those in need of long- or short-term assistance. The organization provides a variety of social services, including groceries, clothing, sack lunches, school supplies, financial assistance for prescription medications, transportation or utilities and spiritual support. 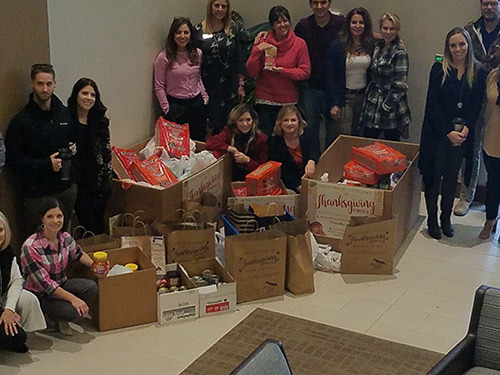 Team members from David Weekley Homes donated more than 1,700 pounds of nonperishable items to Christian Assistance Ministry to benefit families in need.